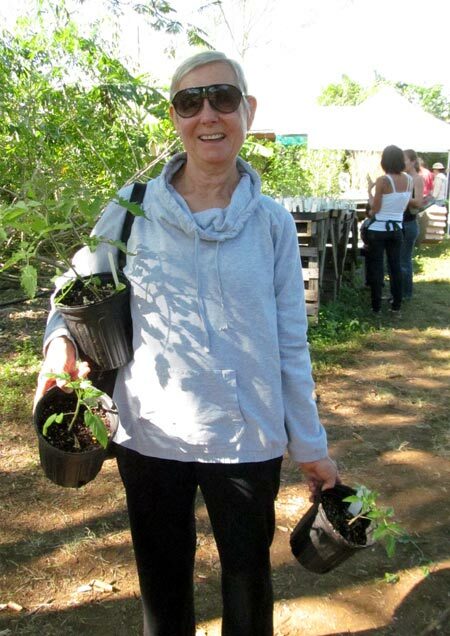 It started with emails, first a trickle, then a wave, pouring in to Farmer Margie’s inbox. They all said pretty much the same thing. 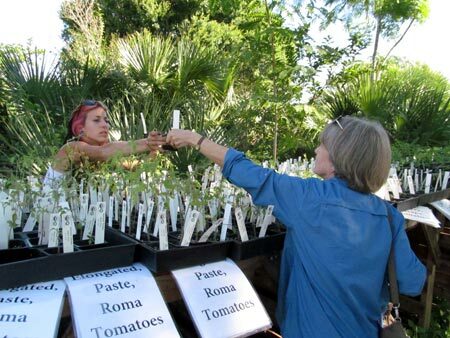 “I didn’t make it to GrowFest,” or “I went looking for you at the Edible Garden Festival but you weren’t there.” Avid gardeners were hungry for their annual fix of organic heirloom tomato seedlings from Bee Heaven Farm. Ish (left) helps a buyer pick out the perfect plant. So for those who missed out, plants left over from GrowFest! 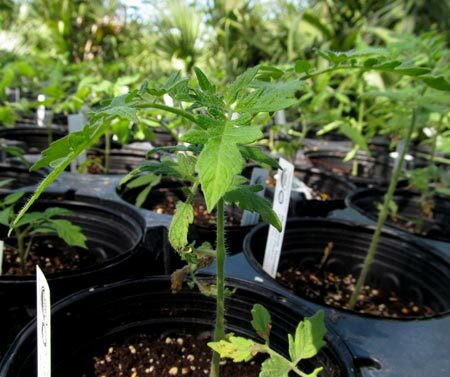 were up for grabs last Saturday at a special seedling sale. The event ran from 10 am to 2 pm. People started trickling in just before 10, making the long walk down the farm driveway. It was the perfect day for visiting Bee Heaven Farm. A crisp, cool morning drenched with dew gently warmed to tee-shirt weather by noon. The sky was clear, brilliant blue, and turkey buzzards swirled high overhead, riding thermals created by freshly tilled and bedded fields. A mockingbird twittered somewhere in the spreading branches of a large poinciana tree, beneath which tables of seedlings were set up in the dappled shade. Gardeners dove in, searching for the perfect plants to take home. “Do you have… ” they asked, and farm helpers Victor and Ish were quick to assist. 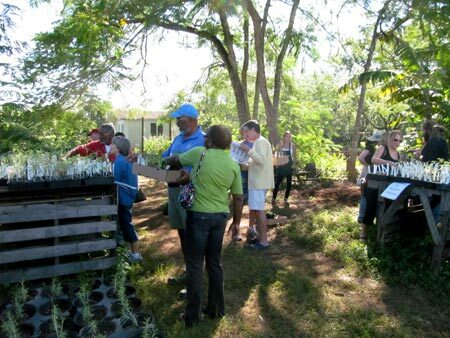 It was a treasure hunt, this search for perfect plants. The stars of the show were heirloom tomato plants: Sun Gold, Lollipop, Beam’s Yellow Pear, Green Grape, Black Zebra, Pineapple, Black Prince, Brown Berry, Homestead 24, Lime Green Salad. Some people were partial to smaller varieties, others liked big beefsteaks. Most people said they planted in raised beds, but I spoke to a fair number of container gardeners, too. Farm helper Victor tells it like it is about growing yuca. Most people knew just what they wanted. 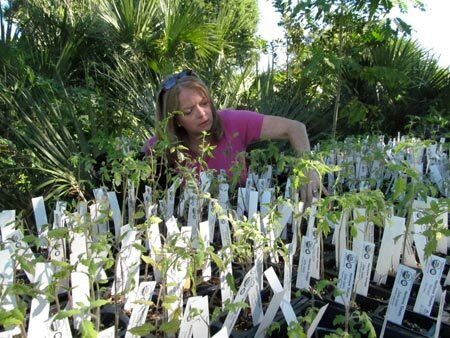 One woman came with plastic printed slips of names of tomatoes that she grew from last year. Others browsed through the assortment and bought mass quantities. Buy five, get one free. Buy 15, get five free. Enough to fill up the whole back yard and share with the neighborhood. 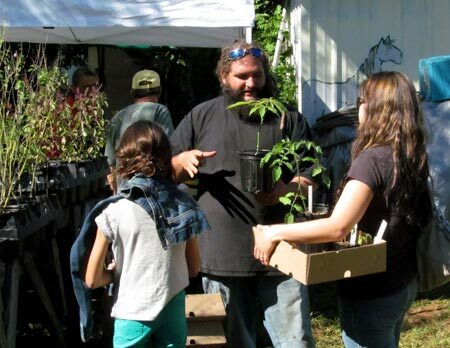 By closing time, it was estimated that about 80 people came, and almost half the plants were sold. Barbecue master and published author Steve Raichlen also stopped by. He marveled at the tub full of smoked eggs made by Robert Barnum of Possum Trot Tropical Fruit Nursery. Apparently smoking eggs is one thing he hasn’t yet tried to grill or smoke. He wrote about the encounter on his blog here. 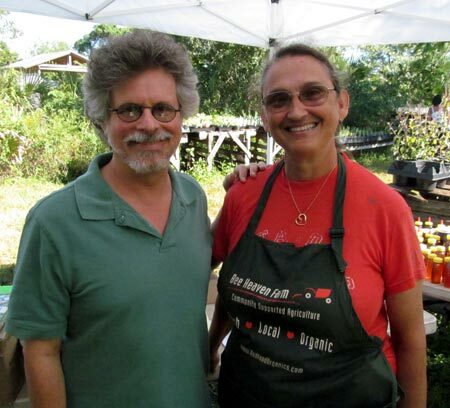 Steven Raichlen, barbecue master and author of many books on grilling, with Farmer Margie. 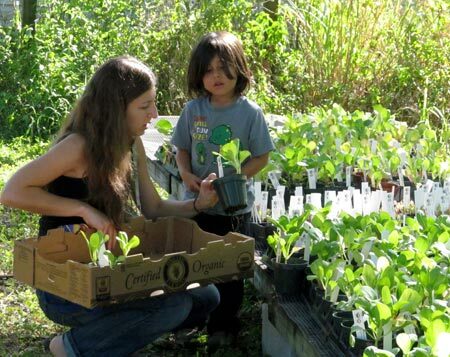 If you missed this sale, you’ll have to wait to buy plants until December when Bee Heaven Farm will be at Pinecrest Gardens Farmers Market. The farm is not open to the public except for occasional events. A happy shopper loaded down with tomato plants. 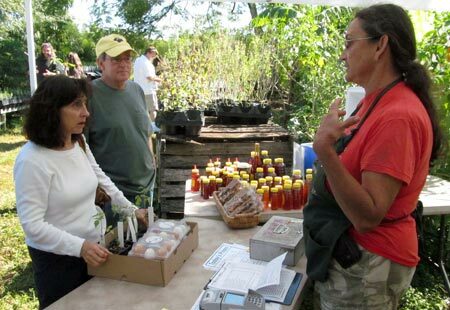 Farmer Margie (right) chats with customers. Coveted organic heirloom tomato seedlings.